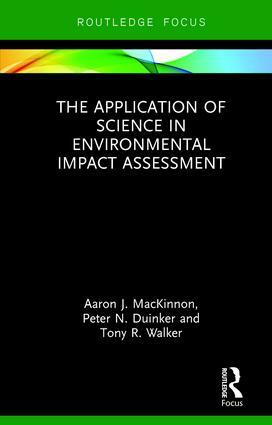 This book charts the history of the application of science in environmental impact assessment (EIA) and provides a conceptual and technical overview of scientific developments associated with EIA since its inception in the early 1970s. The Application of Science in Environmental Impact Assessment begins by defining an appropriate role for science in EIA. From here it goes on to reflect more closely on empirical and deductive biophysical sciences as they relate to well-known stages of the generic EIA process and explores whether scientific theory and practice are at their vanguard in EIA and related applications. Throughout the book the authors reflect on biophysical science as it applies to stages of the EIA process and also consider debates surrounding the role of science as it relates to political and administrative dimensions of EIA. Based on this review, the book concludes that improvements to the quality of science in EIA will rely on the adoption of stronger participatory and collaborative working arrangements. Covering key topics including foundational scientific guidance materials; frameworks for implementing science amid conflict and uncertainty; and emerging ecological concepts, this book will be of great interest to students, scholars and practitioners of EIA. Aaron J. MacKinnon has a Master of Environmental Studies from the School for Resource and Environmental Studies, Faculty of Management, Dalhousie University, Canada. Peter N. Duinker is a professor at the School for Resource and Environmental Studies, Faculty of Management, Dalhousie University, Canada. Tony R. Walker is an Assistant Professor at the School for Resource and Environmental Studies, Faculty of Management, Dalhousie University, Canada.